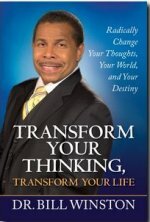 Description: Transform Your Thinking, Transform Your Life - Radically Change Your Thoughts, Your World, and Your Destiny. In the book of Romans, the apostle Paul encourages believers to be transformed by renewing their mind. The Greek word for transformed is "metamorphosis" or "to change." Dr. Winston reveals that believers must believe what God says about them and their situations, more than what their circumstances say. They must build a new way of thinking. Dr. Winston encourages that God’s Word takes a higher place than their current situations. God promises an abundant life, not a barely-get-through-it life, but that is where many believers have been living. Readers will begin to discover God’s promises and find ways to renew their minds through study and meditation, giving them the inner strength to overcome adversity and find success in every area.